DriveOptix™ - Torga Optical - Fashion Eyewear, Spectacle Spectacle Deals and German Precision Lens Technology. Solutions for your visual day! DriveOptix™ is a product specially developed by Torga Optical to reduce the risks of driving, by optimising drivers' visual acuity. Driving at NIGHT can be a daunting experience. Oncoming headlights and street lights reflecting off one’s spectacles can prevent light passing through the lenses. Torga Optical’s Anti-Reflective Coating has been specifically designed to manage these situations. By minimising reflections, more light passes through one’s lenses, which optimises visual acuity with fewer distractions. During the DAY, the sun’s rays as well as reflections off surfaces such as the road, other vehicles or water can also compromise your vision. With Torga Optical’s Polarised lenses, this glare is significantly reduced. From only R900* extra, DriveOptix™ provides you with the latest in German precision lens technology for both DAY and NIGHT time driving. 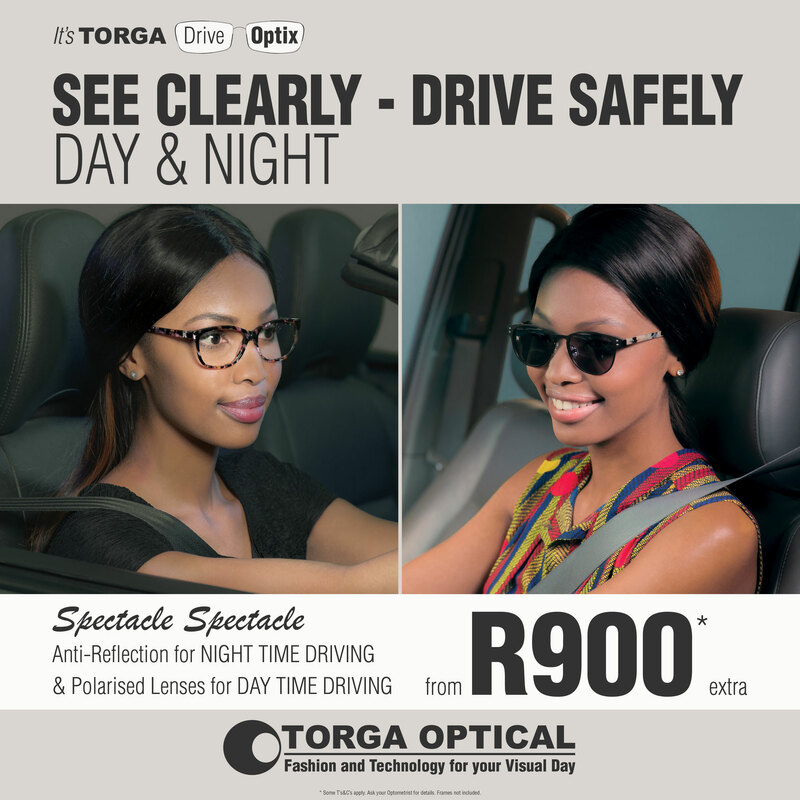 When you purchase any one of Torga’s Spectacle Spectacle offers, we can apply our state-of-the-art Anti-Reflective Coating to one pair and Polarise the other – from only R900* extra. DriveOptix™ is a cash only offer that is an add-on when purchasing a Torga Optical Single Vision (stock lens) Spectacle Spectacle offer that is not being shared. The same prescription has to be applied to both pairs of lenses for this promotion. It consists of an additional anti-reflective coating applied to (single vision stock) lenses of one pair of spectacles and Polar T to the lenses of the second pair of spectacles (this offer is only available as an add-on). For specially prescribed and manufactured lenses (single view, bifocal and multifocals) and/or an uprgade to Nu Polar, the additional costs are for the customer's account. All standard Torga Optical terms and conditions apply. E&OE.